The below review is one of the best I've seen on this site. Clientele mainly a better-class overspill version from The Nelson. 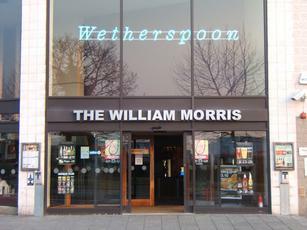 I went to the William Morris last week and really enjoyed it. There was a fine selection of alcopops, scampi and chips and a little man sitting on a chair whose leg's didn't reach the floor. 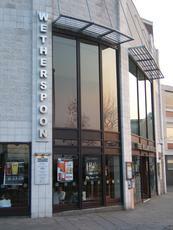 The bar staff were friendly if a little simple and the other clientele were great. It reminded me of Billy Smart's Circus and I will be going back. Nipped in for a pint and was disappointed to find a huge number of handpumps were clip-reversed and only three real ales were on. As the weakest of these was Abbot and the other two were brainkillingly strong and I was driving I had no option but to leave. Well I managed to use a 50p off CAMRA voucher in here, about the best thing I can say about it really. The beer range was dull, dull, dull and settled for a pint of (yawn!) Abbott Ale which was OK. The food we ordered (reason for coming here) was fairly poor, served on cold plates and the use of oven chips spotted a mile off - shame on JDW! A weekend in Oxford and easily the worst pub we visited by a long chalk, is it just me or are JDW pubs getting worse in general no matter where they are located?